The Ford Fiesta is one of the most popular subcompact cars on the market, with tens of thousands sold each year. However, it's not just a great choice for its design alone; it also comes with some amazing smart features. The patented MyKey® function makes it easier and safer than ever to tailor your Ford Fiesta's function depending on who's behind the wheel. MyKey® ensures that safety belt reminder chime stays on, the audio system is muted, and that speeds can be limited. It's a great choice if you share a car with a new driver. 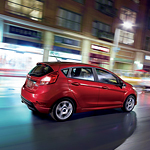 The Ford Fiesta also comes with an intelligent access and push-button start function. As long as you have your key fob with you, you'll get into your car - and out on the road - within seconds. If you're interested in trying out these great design features for yourself, why not visit Mojave Auto Group today for a test drive?